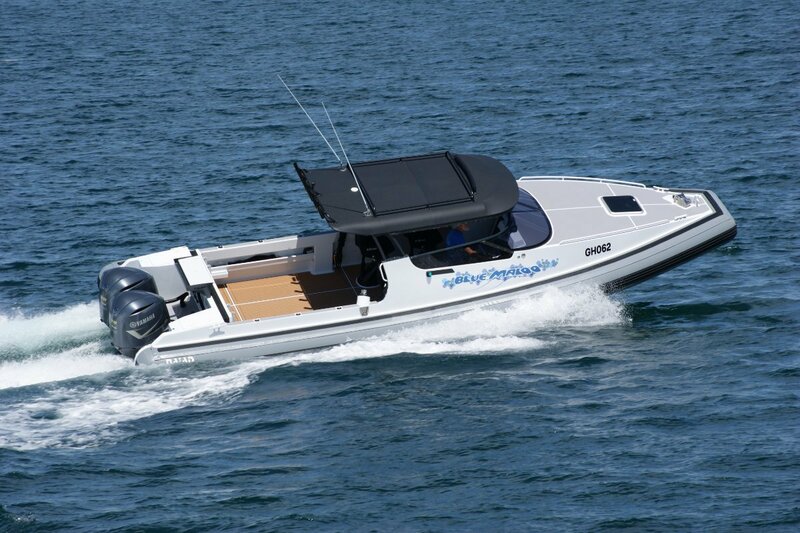 The ten metre Naiad hull is not new – it has been used for several Water Police vessels - but most features are different. The builder, Kirby Marine, wanted to create a leisure vessel capable of operating safely in the foulest weather, and able to deliver comfort in only slightly better. Meaning, of course, that most of the time it would give an armchair ride. A key difference to most Naiads is the D-section collar instead of circular. One of the advantages is increased internal beam. It also makes it simpler to extend the aluminium sides higher; now a standing fisherman makes contact with it well above the thigh. The tubes are filled with closed cell foam rather than air, offering increased durability. There is a theoretical down side: these more resilient tubes deliver a harsher ride than the alternative. Realistically, it is a very small difference that it takes an expert to detect. These high aluminium sides contain useful goodies for the angler, pockets for a start – something rare in a rigid inflatable. Also a lot of sockets let into the top; these are to allow the bait board to be sited wherever is convenient at the moment, and to accept electric reels. This boat’s capabilities allow it to fish well over the shelf’s edge, and winding in several hundred metres of line by hand soon loses its charm. At those depths you need something special in sounders and the Naiad has it, feeding a pair of Raymarine Axiom Pro multi format screens. This equipment gives 3-D imaging of the bottom and information on the different layers in the water column. The fish stand little chance. The cuddy cab layout manages to sleep four: as well as the usual V-berths there are fold down bunks above them. Also located forward are a fridge and a toilet with holding tank. A large, clear fore hatch lights the area. The soft top covering the driving area is a Kirby speciality, with a possibly unique feature. How many soft tops do you see with hand rails above them? On the other hand, without them how do you safely use the side decks, especially if clears are fitted? The Naiad not only has them but also transverse bars to carry surfboards and to mount a light bar. A Kirby trademark is the side ladder. This folds to disguise itself against the port side support for the soft top. Port side? 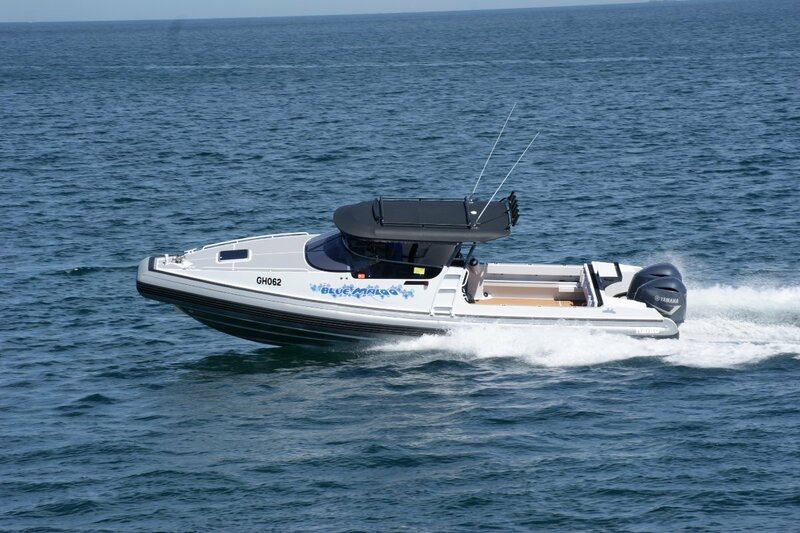 The safe side when parked on a road – with the right tow vehicle this is a trailable boat. There is a stern ladder as well, of course, but many people are happy to board from the water a long way from the propellers. The sheltered area contains four of the legendary jockey style Ullman suspension seats. Not especially comfortable at first straddle, they allow a long day’s sitting without a single ache. The craypot winch is just aft of this area; it is controlled by a foot switch. The motors were an interesting choice: a pair of 300hp Yamahas that provides generous amounts of propulsion. The interesting part is that V8 300s were chosen rather than the lighter and cheaper V6 300s. In the owner’s view cubes count; perhaps he was thinking of the 1960s duels between 3.3 litre Ferraris and 7.0 litre Fords at Le Mans. Cubes certainly counted there. The extra torque of the V8s counts here, converting easy progress to effortless. Actual speed achieved was 53 knots. That is seldom going to be wanted, but the more likely speeds will need little throttle and cause little wear. Despite the Naiad’s blistering performance and emphasis on deep water fishing, this remains a family boat. The surfboard racks and the four berths give clues to this role. The freshwater shower for swimmers and the sockets that accept a barbecue as well as the reels and bait board give more. The big Naiad is a lot of boat and it takes noticeable money to buy it - $380,000 – but you could easily persuade yourself that it was an investment. Almost every Naiad ever built resold for more than its new price.